Dallas (AFP) - Errol Spence Jr. solidified his status as one of the best pound-for-pound fighters in the world with 12-round masterclass performance over challenger Mikey Garcia on Saturday. The 29-year-old Spence easily beat Garcia by a unanimous decision to retain his International Boxing Federation title in a welterweight homecoming bout in front of 47,500 fans. 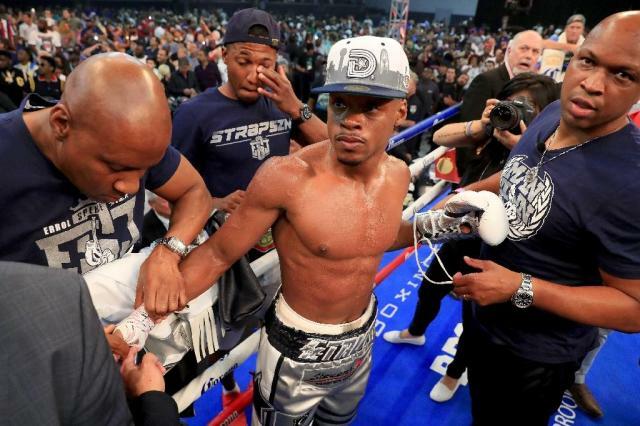 Spence dominated Garcia throughout with a stinging jab and a barrage of combinations and his hometown crowd at the AT&T Stadium in Dallas, Texas cheered wildly as he used his size and reach advantage to put on a boxing clinic. "My motivation was fighting in front of my hometown crowd," Spence said. "This is where I started it from a pup. From the amateurs all the way up. "This is my core fan base. I felt good and I wanted to put on a great performance." The fight was hyped as a showdown of two unbeaten boxers but it didn't turn out that way with one judge scoring it 120-107 for Spence. The other two had it 120-108 and 120-108. Garcia never landed more than 10 punches in a single round. Spence landed 375 total punches to just 75 for Garcia, who was fighting for the first time as a welterweight after moving up two divisions. Pacquiao appeared in the ring after the final bell and said he was willing to face the much younger Spence. "I am looking at the winner of this fight. Spence wants to fight me," said Pacquiao. "I am hoping to be back here, soon." Spence said he also wants to fight Pacquiao. "He is a legend of the sport. It would be my honour to fight him next." Spence improved to 25-0 but failed to get the knockout he wanted against Garcia in his third defence as his KO streak was stopped at 11 fights. This is just the fourth time in his career that the former 2012 US Olympian didn't knock out his opponent. "People said I couldn't box," said Spence. "You saw it today. I can box, I can move my head. I can do it if I want to." "He is the truth. He is for real. He came out with a game plan, kept his distance. I couldn't make adjustments," Garcia said.